The Embedded Citizen: Did the Chinese Really Know what they where doing? Did the Chinese Really Know what they where doing? 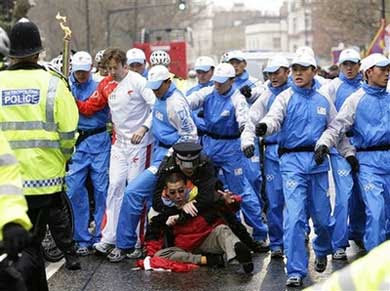 Today, protesters took to the streets as the Olympic torch was carried trough the streets of London. Now there will be months and months of new protests against Chinas policy on Tibet, Burma and Darfur. We will se lots of manifestations against the lack of Freedom of Speech and Democracy in China. And there will be plenty of time to protest against the lack of Human Rights there. I've got a feeling that the Chinese regime did not know what it was doing, when bringing the Olympic Games to their country. And I cannot remember seeing this much international protests against the Chinese leadership ever before. AP on todays protests in London.